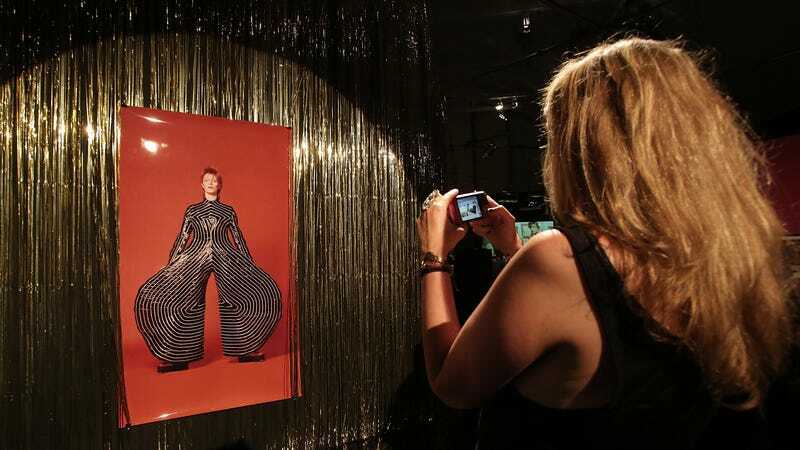 If you didn’t get the opportunity to experience the David Bowie Is... exhibit in any of the 12 cities it set up shop, the folks from the David Bowie Archive and Sony Music have got your back: The touring exhibition that drew over 2 million visitors has been granted digital immortality with an augmented reality mobile app for iOS and Android. Near the end of 2010, an archivist for Bowie’s personal collection contacted the Victoria and Albert Museum in London and asked if they’d be interested in a display. Bowie had saved most of the artifacts, costumes, and props from his career, and by that point, had almost 75,000 pieces stored away. The show was a success, which resulted in the decision to take the exhibit on tour. When Bowie died in early 2016, the museum tour was almost canceled, with concerns about if and how the show would go on. There were also discussions as to whether to keep the name in the present tense (“David Bowie Is”). Eventually, the tour continued with the name, and went on to sell roughly 2 million tickets in museums around the world. The AR adaptation of the exhibit is the first of its kind, and mirrors the physical exhibition through 3D renderings that preserve and present Bowie’s costumes and treasured objects in 360-degree detail. It’s enhanced by an immersive audio experience featuring Bowie’s music and narration that’s best experienced with headphones (or whatever Apple calls their little ear nubbins). Additionally, the David Bowie Is... mobile app will feature dozens of items not featured in the original exhibition and will be offered in seven different languages, so even people who aren’t “Young Americans” can take in the full experience. Davie Bowie&apos;s first-ever studio recording found gathering dust in somebody&apos;s "bread basket"